Dave Eggers—Pulitzer Prize finalist for A Heartbreaking Work of Staggering Genius and author of What Is the What and The Circle, among other books—demonstrates his mastery of the short story. "What It Means When a Crowd in a Faraway Nation Takes a Soldier Representing Your Own Nation, Shoots Him, Drags Him from His Vehicle and Then Mutilates Him in the Dust"
"The Only Meaning of the Oil-Wet Water"
"On Wanting to Have Three Walls Up Before She Gets Home"
"Climbing to the Window, Pretending to Dance"
"Notes for a Story of a Man Who Will Not Die Alone"
"About the Man Who Began Flying After Meeting Her"
"Up the Mountain Coming Down Slowly"
"After I Was Thrown in the River and Before I Drowned"
Dave Eggers is the author of six previous books, including Zeitoun, winner of the American Book Award and the Dayton Literary Peace Prize. What Is the What was a finalist for the 2006 National Book Critics Circle Award and won France’s Prix Medici. That book, about Valentino Achak Deng, a survivor of the civil war in Sudan, gave birth to the Valentino Achak Deng Foundation, which operates a secondary school in South Sudan run by Mr. Deng. 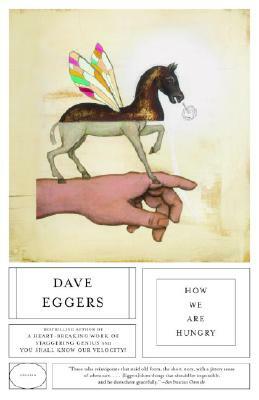 Eggers is the founder and editor of McSweeney’s, an independent publishing house based in San Francisco that produces a quarterly journal, a monthly magazine, The Believer, and an oral history series, Voice of Witness. In 2002, with Nínive Calegari he co-founded 826 Valencia, a nonprofit writing and tutoring center for youth in the Mission District of San Francisco. Local communities have since opened sister 826 centers in Chicago, Los Angeles, New York, Ann Arbor, Seattle, Boston and Washington, DC, and similar centers now exist in London (the Ministry of Stories), Dublin (Fighting Words) and in Copenhagen, Stockholm, Melbourne, and many other cities. A native of Chicago, Eggers now lives in Northern California with his wife and two children.